Overview - Ashton Kutcher is Steve Jobs, the iconic Apple innovator and groundbreaking entrepreneur. This inspiring and entertaining film chronicles Jobs' early days as a college dropout to his rise as the co-founder of Apple Computer Inc. and forced departure from the company. More than a decade later, Jobs returns and single-handedly sets a course that will turn the once-tiny startup into one of the world's most valuable companies. His epic journey blazes a trail that changes technology – and the world – forever. Special Features: Ashton Kutcher is Steve Jobs: Ashton Kutcher and others discuss the challenges of playing one of the most enigmatic figures in American history, and co-stars reflect on how Kutcher transformed himself into the groundbreaking entrepreneur. The Legacy of Steve Jobs: Cast and crew reflect on how Jobs and his innovations have impacted and inspired everyone's daily lives. Jobs - Behind the Score: Composer John Debney explains how he approached creating the score. When one thinks of the late, great Steve Jobs, many words immediately come to mind. Inspiring words like innovation, rule breaking, creativity, and vision. Sadly, however, those same words don't really come into play when describing 'Jobs,' the first theatrical biopic to tackle the computer mogul's life. Though the film does a solid job of chronicling the birth of Apple, and Ashton Kutcher ends up turning in a surprisingly effective performance, the script and direction are disappointingly generic and shallow. The results are still worthwhile enough, but "worthwhile enough" doesn't exactly stand in line with Jobs' trademark penchant for perfectionism and risk taking -- does it? Based on the life of Apple co-founder Steve Jobs, the film chronicles the celebrated inventor/entrepreneur's rise to prominence in the computer business. From his early college days to his initial partnership with engineer Steve Wozniak, the film depicts all the trials and tribulations of turning a pipe dream in a garage into a multi-billion dollar corporation. And while Jobs' success is impressive, we also bear witness to his notable failures and setbacks, watching him lose everything he worked so hard to create, only to see him reemerge and attempt to reclaim it all again. Though we start off in 2001 during the unveiling of the iPod, the narrative quickly flashes back to the 1970s, and from there we essentially move chronologically through the years, stopping at all the major bullet points that define Apple's rise and fall. Initially, some of these transitions between time periods feel a little clunky and choppy (particularly during Jobs' hippie days), but the movie does eventually find an engaging rhythm. Throughout it all, the emphasis is mainly placed on Jobs' business dealings, and though his personal life is briefly touched upon, for the most part, these aspects are sadly ignored. Thankfully, the backstage drama at Apple proves to be fairly interesting on its own, and as we watch the company and Jobs succeed and fail, we start to gain a decent understanding of the man and what makes him tick. Admittedly, I'm not really a big admirer of Ashton Kutcher. Actually, I find him rather annoying, and when I saw that he was cast as Steve Jobs my initial reaction was confusion. And while that confusion remained as the movie's first few scenes played out, Kutcher's casting eventually started to click, evolving beyond the affected impersonation it initially appears to be. Instead, the actor does end up crafting a believable character, and offers a solid approximation of Jobs' trademark vocal cadence and walk. Kutcher also does a nice job of evoking the man's passion, dedication, perfectionism, and incredible arrogance. On that note, though we see a lot of what made Jobs such a successful leader, the movie certainly doesn't shy away from his flaws, and Kutcher's performance is nicely balanced, revealing the man's equally inspiring and unpleasant traits. Unfortunately, outside of Jobs' basic characterization and a broad celebration of outcasts and innovation, the movie really fails to offer much more than a surface examination of its complicated subject and the events that unfold. We see a decent approximation of the Steve Jobs/Apple story but the narrative is missing an emotional soul beneath all the facts, and certain stretches start to drag. While Jobs endures great success and failure, we never really delve into the effects that they have on his life. Instead, we just get the bare minimum needed to convey the gist of the story and characters. Director Joshua Michael Stern tries to dress up the thin scripting with a few stylistic montages (soldering has never been so exciting!) and an overreliance on overbearing musical cues, but a lot of this flash just feels empty and pedestrian, and the movie's attempts to be inspirational often come across as forced and excessive. If 'Jobs' was an Apple product in development, it's unlikely it would have ever made it to store shelves. For better or worse, however, the filmmakers don't seem to have the same dedication to innovation and perfectionism as their subject matter. Competent but generic, the movie covers a fair amount of ground but barely seems to scratch the surface of its fascinating protagonist. In the end, the whole affair feels a bit incomplete and unfulfilled. On the upside, Ashton Kutcher really does turn in a solid performance, and though it lacks personal drama and thematic depth, the plot is engaging and entertaining. As a basic introduction to Steve Jobs and Apple, the movie mostly succeeds, but as a film that aspires to examine the deeper intricacies of the man, his triumphs, failures, flaws, and legacy, the picture offers little more than superficial observations. Rather than an iPod, the movie is more like one of those cheap knock-off players. It gets the job done, but leaves you wishing you had just paid the extra cash for something a bit more polished and fully featured. 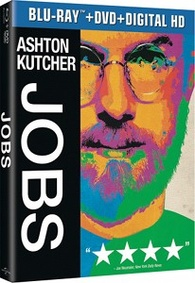 Universal presents 'Jobs' in a Blu-ray/DVD/UltraViolet combo pack. A single BD-50 disc comes housed in a keepcase with a cardboard slipcover along with a separate DVD disc and instructions for a digital copy. After some skippable trailers the screen transitions to a standard menu. Ashton Kutcher is Steve Jobs: Ashton Kutcher and others discuss the challenges of playing one of the most enigmatic figures in American history, and co-stars reflect on how Kutcher transformed himself into the groundbreaking entrepreneur. The film is presented in a 1080p VC-1 transfer in the 2.35:1 aspect ratio. Sharp, vivid, and clean, this is a very impressive picture that's essentially problem free. Shot on the Arri Alexa, the digital source offers a glossy, high-def image free from any troublesome artifacting. With that said, artificial grain is present in a few scenes, lending some extra texture to the picture. Detail is impeccable, with crisp clarity and pleasing dimension realizing every tiny microchip and circuit board in all their glory. Early scenes set in the 70s veer toward a golden hue, while 80s scenes carry a comparatively cool palette, and no matter what time period we're in, colors remain rich throughout with strong pop. Contrast is high with slightly blown out whites, and blacks remain inky without any troublesome crush. The movie's style does have a fairly basic and occasionally "TV" look, but the image itself is richly detailed and technically strong, offering a nearly flawless video presentation. The movie is provided with an English DTS-HD MA 5.1 track along with optional English SDH, French, and Spanish subtitles. With relatively engaging design work and a great soundtrack, the mix ends up working very well. Dialogue is clear and full-bodied with no technical hiccups or balance issues. The soundstage carries a good sense of atmosphere and texture with strong directionality and solid surround activity when called for. Wind, rustling leaves, traffic, office ambiance, and other effects are spread naturally adding a little extra sense of character to specific scenes and locations. Likewise, the film's soundtrack of classic rock tracks comes through with excellent fidelity and separation. The original score also features strong range, but the music itself can be a bit overbearing. Nicely balanced and relatively immersive, the track does a good job of complementing the film, and outside of the overly rousing score, the audio feels natural without drawing too much attention to itself. Universal has put together a decent collection of supplements, including a worthwhile commentary and a few fluffy featurettes. All of the extras are presented in 1080p with Dolby Digital 2.0 audio. Commentary with Director Joshua Michael Stern - Stern offers a steady and informative discussion on the film, detailing the movie's financing, locations, and deviations from fact. He also elaborates on many of the real world events depicted in the story and explains his approach to the material and subject. Those looking for more details on Jobs' life and how the filmmakers adapted his story to the screen, should definitely take a listen. Deleted Scenes (HD, 4 min) - Three brief deleted scenes are presented together. The excised bits show more of Jobs' straining relationship with his girlfriend and his family life, and probably should have stayed in the film. Ashton Kutcher is Steve Jobs (HD, 2 min) - This is a behind-the-scenes featurette focused on Kutcher's performance as Jobs with cast and crew interviews, movie clips, and on-set footage. Unfortunately, this is too short and fluffy to offer much substance. The Legacy of Steve Jobs (HD, 3 min) - Another promotional featurette with clips and interviews is included, this time focusing on Jobs' lasting impact. Sadly, like the last extra, most of the material is just clips from the film and there are few very few worthwhile insights. Jobs: Behind the Score (HD, 3 min) - Here we get a look at how the composer crafted the film's score. He discusses his influences and his approach to the movie's themes while we are treated to clips of various recording sessions. Though not very in depth, this is actually the most interesting featurette included. 'Jobs' offers a generic but relatively engaging look at the life of Steve Jobs and his work with Apple. The script and direction are a bit thin, but Ashton Kutcher turns in a surprisingly solid performance and the subject matter remains interesting -- even if one is left wishing the filmmakers delved deeper. On the technical front, this disc from Universal features exceptional video and a good audio mix. Most of the supplements are disappointingly superficial, but the commentary track is informative. Though the film doesn't fully succeed, those looking for a decent introduction to Steve Jobs' fascinating life will still want to check this out. Worth a look.